Herald & Review/Kelly J. Huff Rick and Connie Dunscomb, parents of Seth Dunscomb, cheer on the swimmers in a butterfly heat during morning action at the Millikin University swimming pool as the Seth Dunscomb New Year Opener gets underway. Dunscomb died at poolside of a heart ailment in 1997 during a practice for the University of Kansas swim team. Herald & Review/Kelly J. Huff Elaina Crawford a member of the Sullivan Blue Dolphins Swim Club, competes in the 10-meter backstroke at the Millikin University swimming pool during the Seth Dunscomb New Year Opener. DECATUR - Seth Dunscomb was a magnificent swimmer and outstanding leader, who died suddenly at poolside of a heart ailment in 1997 during a practice for the University of Kansas swim team. The following year the Decatur Swim Club's New Year Opener swim meet was named after Seth, a former club member who made many friends while working out in Decatur. 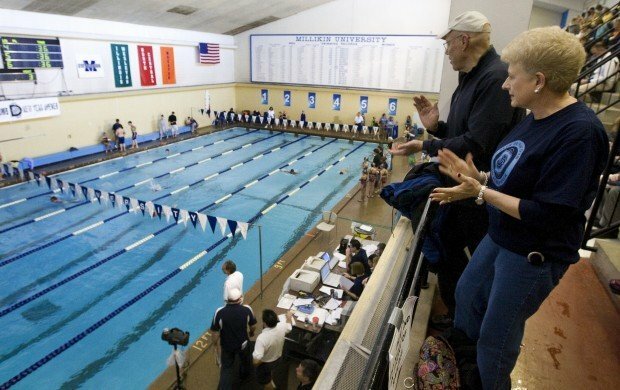 In its 14th year, the memory of Dunscomb, a state champion in the 200-yard individual medley while at Sullivan High School, has been kept alive by the meet, held at Millikin University's Griswold Center this weekend. About 300 swimmers, ranging in age from 5 to 18 years old, are competing this year, said swim club president Cindy Staudenmaier. The swimmers are members of 12 different clubs from towns throughout Central Illinois. Daniel Jurgens, a 16-year-old swimmer, has been attending the meets for as long as he can remember. Daniel is the youngest of five children of Carl Jurgens and Carol Cunningham, all of whom have been members of the Decatur Swim Club and excelled at speeding through the water. A junior at St. Teresa High School, Daniel was the first swimmer from Decatur to qualify for Junior Nationals in 10 years or more, said Robert A. Johnson, head coach of the swim club. At the national meet, held in Atlanta in December, Daniel was ranked first in Illinois in the 100-yard breaststroke and among the top three in the 200-yard individual medley. Johnson said Daniel, who practices about 22 hours a week, including sessions at 5:30 a.m. and 5:45 p.m. three days each week, could qualify for the Olympic trials if he shaves two seconds off his breaststroke time. Daniel gives the credit for his success to his parents, who were busy Saturday helping with the three-day meet. His father, an oral surgeon, is the head timer, while his mother, a dentist, runs the computer, keeping track of the swimmers' events and times. Carl Jurgens, who swims at Griswold at 5:30 thrice weekly, was a member of the University of Illinois swim team. Cunningham prefers to stay on dry ground. "My mom is the only one in the family who doesn't swim," Daniel said. "She never did it as a kid." Another source of inspiration has been Lauren, 20, the youngest of Daniel's three sisters. The outstanding member of Wheaton College's swim team, Lauren, a long distance swimmer, is a three-time conference champion who represented Wheaton at the 2010 NCAA Division III Swimming Championship. "Lauren went to all the morning practices," Daniel said. "She made me want to go. That is the hardest thing to get into: early mornings." Daniel's oldest sister, Erin, 24, was a co-captain on Millikin University's swim team. All the swimming practices and meets, and the additional workouts at the Y with a personal trainer, do not interfere with Daniel's studies. A straight-A student, Daniel said his siblings have also inspired him to excel in the classroom. One of his sisters served as class valedictorian, while two were salutatorians. Daniel said spending so much time in the pool helps him focus on his schoolwork. And he still has a little time left over to spend with friends and his close-knit family. 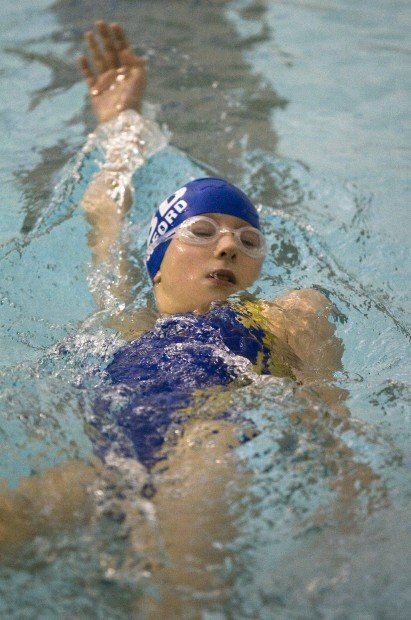 "I still have time to do other things I love, but I love swimming," Daniel said.